I wanted a vintage inspired classy look for the tablescape this year. recycle them for Thanksgiving and Christmas as well. I received fabulous pieces from Oriental Trading Company in exchange for this post! them 13 years ago! They have everything you could possibly need! Keep your fun party supplies and reuse them too! Here's what I love with all the links. I used 3 big sheets of black taffeta for the table cloth. 2 strips to cover my oversize table and one strip scrunched up in the middle like a table runner. This is great for texture and also to cover the seam from using 2 cloths. or some really fun paper products for the perfect table settings. I love the antique frame on the wall and one on the table. 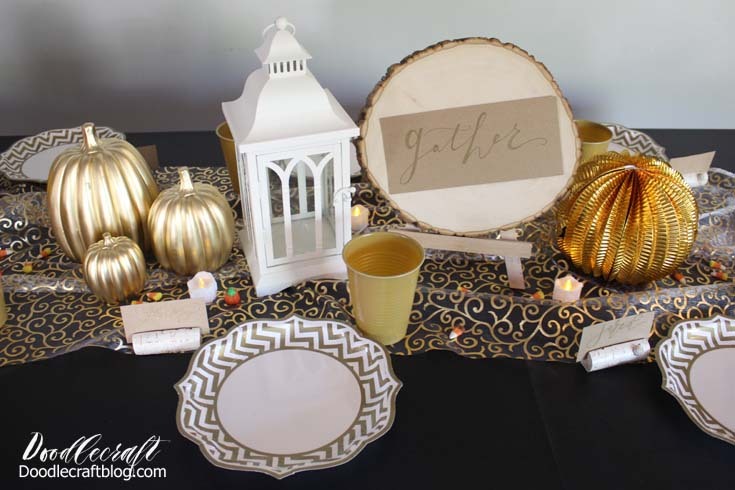 It is a fun way to add a little more texture to the table. I absolutely love the look of these gummy earthworms. but edible and perfect for a creepy cupcake or on the edge of the plate! This glass jar set is really fun. It has a very antique apothecary look to them. They are perfect for candy tables or just for spooky decorations. These would also be great in the bathroom for things like cotton balls! I totally love the candelabra stuff! The centerpiece 3 set is fabulous. It is made of foam board so it is solid and sturdy. It is great to take apart and store flat for the next time you need it. The placecards are flimsier and have a little trouble standing up. They are cute, but just need some tape or a little hot glue to keep them together and in line. Love the creepy Skeleton cat. Read carefully though. It says it has a posable head. I misunderstood and thought the entire cat was posable, until I busted the leg off. With a little E6000 glue, he was all fixed up and back in business! perfect to leave off the table. You can buy a ceramic skull and paint it gold! And the best part is, I can recycle my decor to use for other holidays too! 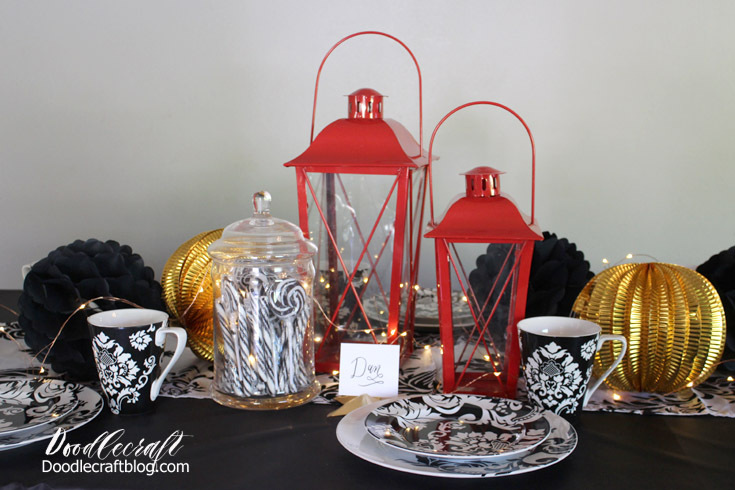 Elegant Black, White, Gold and Red Holiday Tablescape! Come back next week for a fun week of Harry Potter! You'll see much of these decorations mingled in to make the perfect party for Wizards and Witches!